Holiday let Bungalow to rent in Kionia, Tinos, Greece. Traditional blue and white studio with sea views on Tinos.. . 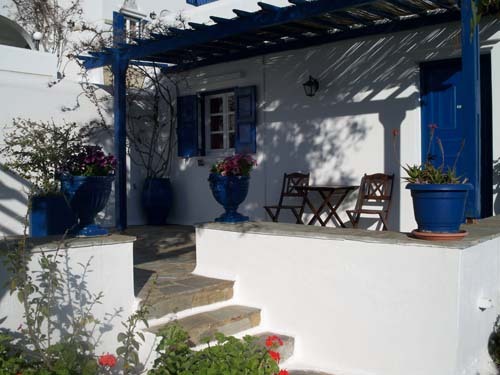 Traditional blue and white studio with sea views on Tinos. 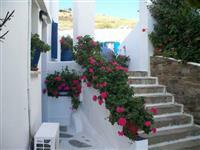 This is modern complex built in a tradtional style of Cycladic architecture. 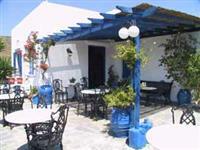 It is ideally situated only 3km away from the port of Tinos, in a picturesque seaside location called " Kionia". 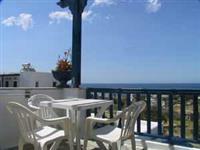 They say that the place was once loved and protected by the ancient Greek god of sea Poseidon with his wife Amfitrete. Here you can see the ruins of Poseidon's temple. 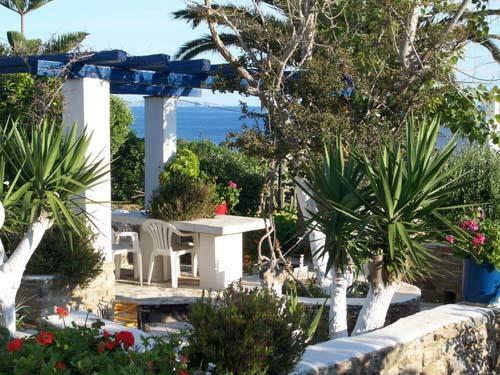 This small complex is built on different levels which gives an amazing dreamy view of the Aegean sea from all the bungalows. The bungalows have been especially designed to provide all the comforts you need on this friedly island. 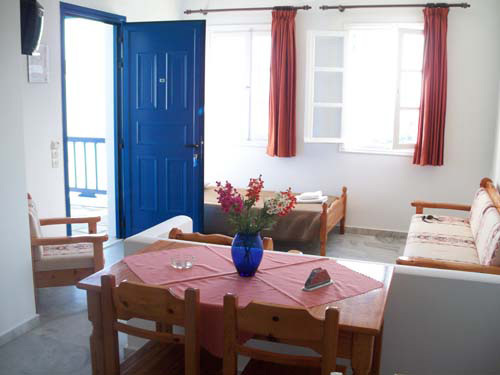 Each has a fully equipped kitchen, a bathroom, comfortable rooms, telephone, as well as a roomy verandah with beautiful flowers and a fantastic view of the Aegean scenery. You can enjoy a coffee and a bite to eat at the snack bar, visit the cocktail bar in the evening and take breakfast in the breakfast room. You do not always need to go out to eat. There is a mini bus provided to take you to and from the port. A parking space is also provided. We encourage you to enjoy the garden, the communal sitting room with satellite tv, Internet service, free WiFi (public areas), breakfast at the breakfast bar and a drink at the bar. The hotel accepts all major credit cards, can assit you with car rental and offer you the use of their safe box. There is access for the disabled. And you favourite friend does not have to stay at home as pets are welcome. Your bungalow will have a sea view, a balcony, a veranda, central heating, air conditioning, a telephone, a television and a bathroom with a shower. Also provided are hair dryer, refrigerator, hot plate, oven and a cot if you need it. 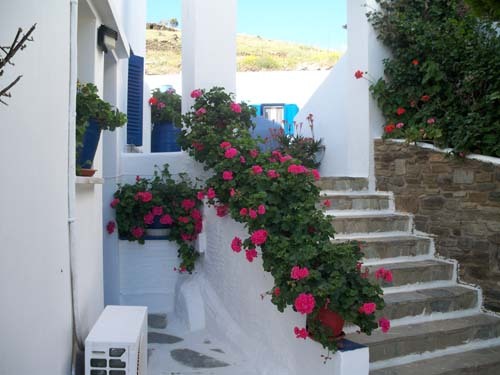 The beautiful island of Tinos, located in the Cyclades archipelago and five hours by ferryboat from Athens, has been settled for well over twenty-five hundred years. It is a peaceful island of forty whitewashed villages and more than 700 churches and monasteries. With its relatively green, mountainous landscape, where tiny chapels and dovecotes are scattered everywhere, Tinos is a very beautiful island. There are interesting villages, and exploring the surroundings with a car is definitely worth it. It can be, at certain times of the year, quite a windy island, so the sea can get rough around Tinos. Perhaps that's why the ancient Greeks believed the God of Winds lived here. As you're staying near Tinos Town and go there for the day you can swim off the rocks at the harbour front if you just fancy a quick dip to cool off. But for a day at the beach head for the nearest- Kionia beach. 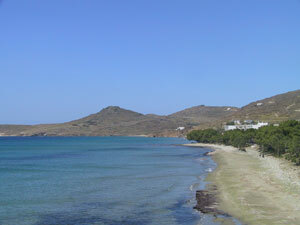 You will find it to be one of the best beaches on Tinos. Notes: There are day bed for a further two people.